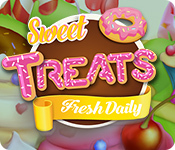 Sweet Treats: Fresh Daily is rated 3.1 out of 5 by 7. Rated 4 out of 5 by moonryu from Not as simple as it looks I like match-3s they are relaxing depending on the setting and the matching rules. Though with all the bright colors and music (you can turn down the sound in the options/setting window), it does have 3 settings -- which is a good thing: relax (no time or moves limits), timed, and moves. It is not as simple as it looks on either the timed or moves settings -- I would not recommend those for kids. You really have to think about your moves before you do them, wild clicking in the time mode is very stressful but literally the only way to maybe get 3 stars. A key note: creating the special abilities like a bomb (match 4), costs a move, but using them (double clicking on them) as long as you don't move them -- don't cost moves. Very critical to remember in the limited moves mode. A final note: Thank you to the developers for actually taking the time to incorporate the player's name into the game, once they create their profile. Quite a few games don't do this and I find it a very nice touch. Overall, I would recommend the game. 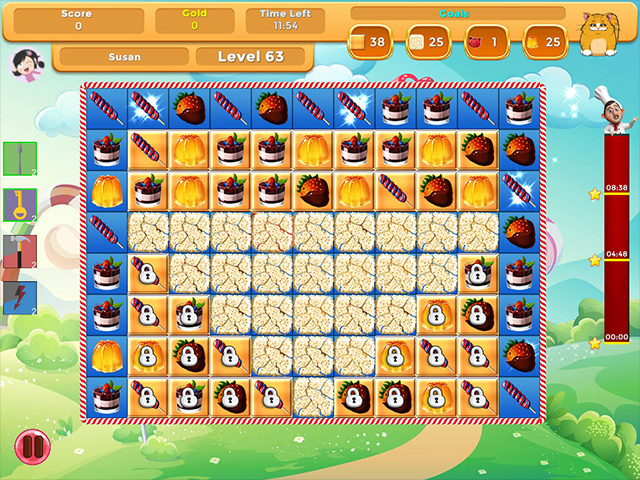 Rated 4 out of 5 by catlynn54 from A charming little match 3 I found this to be a charming match-3 game. Only so much can be done with matching 3. I enjoyed the smiley cat faces and the desserts. Rated 4 out of 5 by raydog from Weird but fun. I bought this game after reading Pennmom's review. The weirdness factor of this game was intriguing. It is very unusual. Sort of like being in that old movie Up in Smoke. The pastry dude comes and hollers at you because you are not doing your best so I bought some more pastries to see where that leads - no where but I'm still enjoying all weird colors and sparkles. The music is tough to listen to. The falling cats are very strange too. It is not a hard match 3 game - standard but the screen shots and map look like a poster from the late 1960s. I give it a plus for that. Makes me want to go to on-demand on my TV and rent Up in Smoke! Rated 4 out of 5 by cheryledz from Good relaxing game - extremely colorful I honestly think this is a kids game. Don't get me wrong, I like to play match 3's that are relaxing and this is relaxing. Not very challenging because it seems as though the bombs come up where you need them. It is "sparkely" and "colorful" I don't think that this is one that I could play for a very long time. I would buy it if it went on sale. You do get to pick an avatar but once again, it seems like they are for kids. I recommend it if you want a relaxing game. 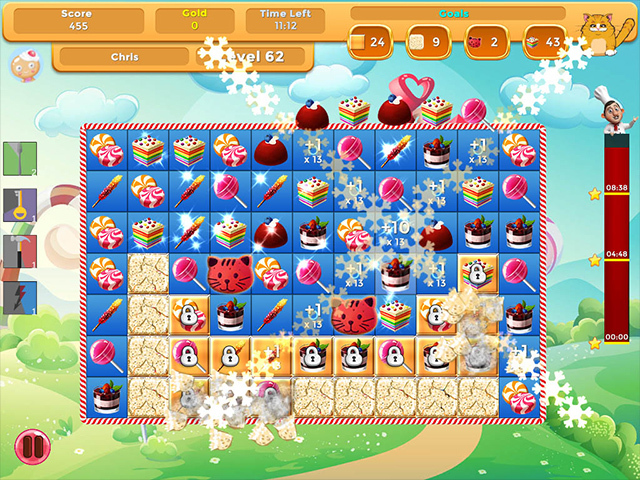 Rated 1 out of 5 by CyndiLouWho2 from Sweet Treats not so tasty Why are these tablet/phone games suddenly being pushed onto us all the time now? I don't want to play games like these on my pc or laptop. 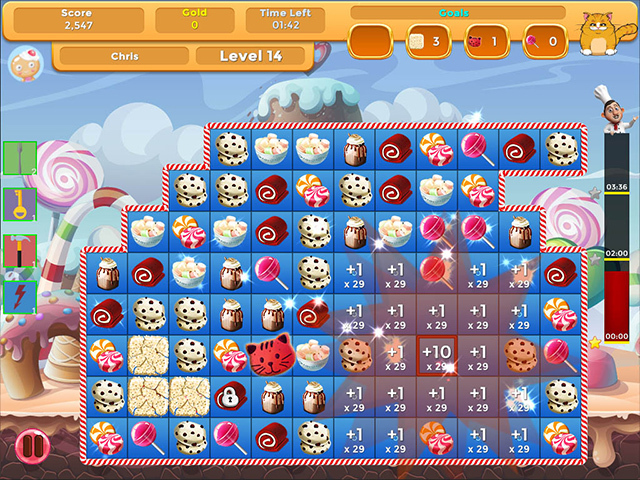 Sweet Treats is another cheesy game with flat graphics and silly game play. It's okay for kids but aren't most kids playing these games on their phones? Graphics are flat & childish and game play is boring. Even with all the cupcakes, glitter and hoopla I have to pass on this one. For a really in-depth explanation of Sweet Treats, read pennmom's review. I can't see wasting my time giving a lengthy review on a game that's not worth it.